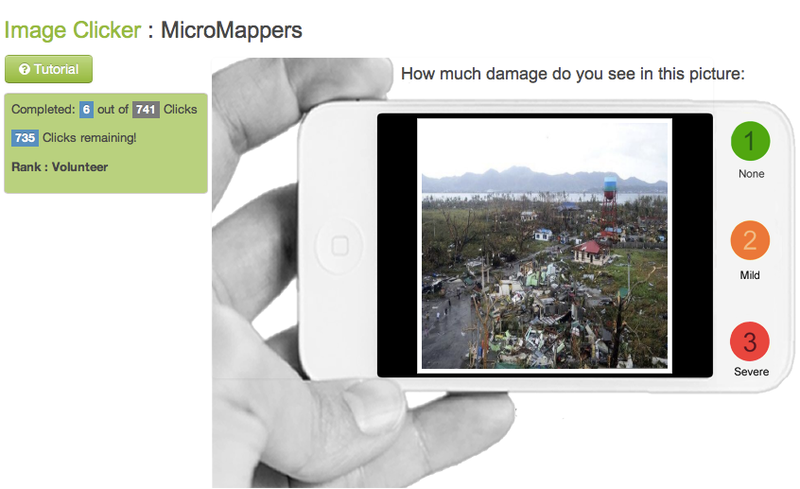 This entry was posted in Big Data, Crowdsourcing, Humanitarian Technologies, Social Computing, Social Media and tagged MicroMappers, microtasking, Philippines, Twitter, Yolanda. Bookmark the permalink. Thanks for your help, Xenia! The categories were requested by our UN partners based on their specific information needs. We’ll be adding “Displaced population” shortly as an additional category as per their request just now. Hope this helps. Thanks again! I’m concerned that the right tweets aren’t making it into the review stream. A large majority predate landfall, which was now 17hrs ago. Obviously there is very little connectivity in Leyte after the storm but we are reviewing a large amount of dated tweets. Hi Mike, thanks for helping out. We started collecting the tweets at 5am local time, ie, 1 hour before sunrise. And we continued collecting tweets until 7pm local time, ie, which was 1 hour after sunset. Not all tweets from today’s collection have been uploaded to the Clicker yet. In any event, I don’t think it is possible that a “large majority predate landfall”, we’ve only uploaded 10% of all tweets thus far and since I have been up since 5am local, I can confirm that their were relevant tweets posted at daybreak. Thanks again for helping out. OK good to hear. I will keep clicking. Thanks very much, Mike, really appreciate it. Hi, I’m from the Philippines and I just started tagging tweets. Should we base tweet relevance on disaster relief or on subject matter? For example, if the tweet contains prayers for the Philippines should that be relevant (yes, it’s about Haiyan) or should it be non-related (not about disaster relief). Thanks! 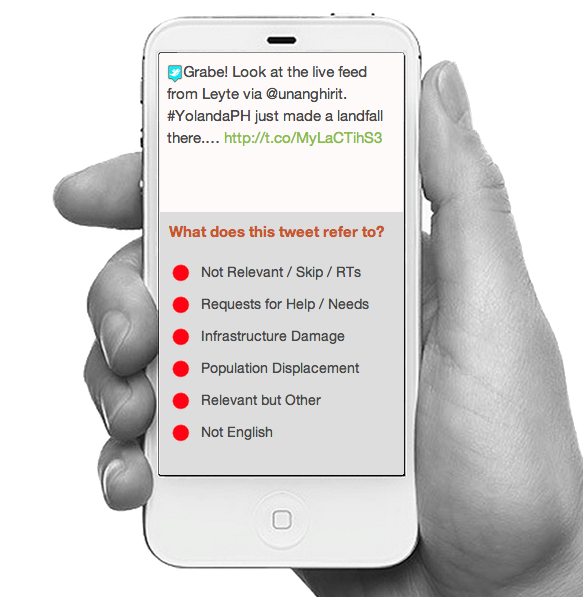 Relevant means any tweets relevant to disaster response efforts. Also, in tweets where there are tinyURLs containing articles or photos, do we have to open the tinyURLs and consider their content in the tweet’s relevance? No need to open pictures, we have the ImageClicker for that but are waiting for more than a few hundred pictures before uploading to ImageClicker. Thank you! Sorry it’s me again. But will have clicked through 200 posts soon and am wondering what hash tags you’re using. Is it just #Philippines and #YolandaPH? For disasters these last few years we’ve been using unified hashtags #rescuePH and #reliefPH. Haven’t seen these yet on the tweets so was wondering if they’re covered in your tweet harvest. There is substantial lag time between clicking on the appropriate category and receiving the next tweet to analyze. In an hour’s time frame (12:30pm – 1:30pm EST), I was able to categorize 100 messages. The majority fell into either the Relevant but Other or Not Relevant category. 6 fell into the other categories: 1 Request for Help/Needs; 3 for Infrastructure Damage; 1 for Population Displacement; and one for Not English. Some of the categories allow room for misinterpretation. Thanks for all you do Patrick! There is lag time between clicking on the appropriate category and receiving the next tweet. In an hour’s time frame (12:30pm – 1:30pm EST), I was able to categorize 100 messages. The majority fell into either the Relevant but Other or Not Relevant category. 6 fell into the other categories: 1 Request for Help/Needs; 3 for Infrastructure Damage; 1 for Population Displacement; and one for Not English. I feel some of the chosen category names allow room for misinterpretation. Thanks for all you do Patrick! Thanks very much, Steve! And apologies for time lag, we’re getting more traffic on the Clicker than we’re used to! Please consider for next app upgrade: Have some visual clue that a click to classify has taken. That would reduce uncertainty during lag… Thanks. Good idea, thanks Ann, and thanks for your help. Way too slow to deliver the next one. Thanks, yes, sorry way too slow, working on it. This morning it was instantaneous, just getting lots of traffic now. thanks for your patience. It would be good if there is a category for General News Stories. I’m putting them as Relevant but Other. Thanks Paul, the categories were given to us by our colleagues at UN OCHA based on their own specific information needs for the relief efforts. Our partners at Translators Without Borders have been handling non-English reports. In the (near) future, we’ll have a TranslateClicker that will help them in this task. Also is there a special site for the Overseas Filipino Workers to classify the non-English reports? Also a category for Fraud or Phishing scams. I haven’t seen any yet but they are bound to occur. Reblogged this on the unbearable lightness of being me.. Thank you! I also posted the cnn help link. TweetClicker was faster today. For ImageClicker, 100 images were assessed in 10 minutes. 5 of them were placed in the category of severe; 1 in mild; and the remainder in none. Recommend “clickers” be patient as you’ll see many of the same images over and over (for example, the purple screen capture of the Viper notification). Hi, how do you want tweets which contain info on how to give aid categorized?